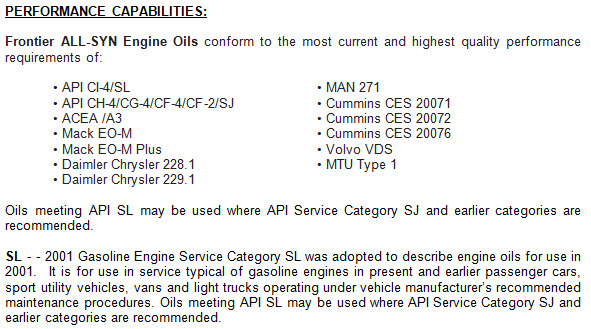 ALL-SYN is premium quality CI-4/SL engine oil designed for all-weather operation of passenger cars and trucks. ALL-SYN is a blend of the highest quality PAO synthetic base stocks and selected additives. It is compounded with Frontier’s exclusive ETX extender additive package and has a much higher viscosity index (VI) than conventional oils. This exclusive formulation provides excellent protection against deposits resulting from long term high temperature operation and meets the demands of today's hotter running, high performance engines. It also provides excellent protection against sludge deposits resulting from the severe service of short trips and stop and go driving. ALL-SYN’s advanced anti-wear additives minimize wear and scuffing of metal surfaces under boundary lubrication conditions. The detergent-dispersant additives protect against sludge formation and varnish deposits. The anti-oxidant additive provides excellent resistance to oxidation (oil thickening) during the higher under hood temperatures common in modern high revving, high performance engines. Rust and corrosion additives protect metal parts during engine operation and shut down. ALL-SYN contains a unique acid neutralizing additive package that protects against the formation of acidic compounds. 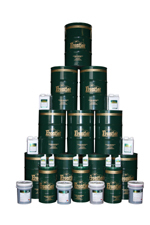 These selected alkaline additives give a much longer lasting Total Base Number (TBN) than regular engine oils. This higher, long lasting TBN provides protection against acid buildup and allows much longer oil change intervals than conventional engine oils. Excellent Natural Lubricity – The high natural lubricity of PAO base stocks reduces frictional wear between surfaces. High Viscosity Index – This feature insures the oil does not thin out at elevated temperatures. Long Life Lubricant – Because synthetics can tolerate higher temperatures, there is less oxidation and less corrosive acids formed that can attack soft metals and reduce oil life. Low Pour Point – Synthetics have very low pour points which allow better low temperature fluidity. This feature provides better lubrication at start-up, reducing start-up wear. Excellent Anti-Wear Properties – Proprietary anti-wear additives, give additional protection in heavy loaded areas such as valve trains. Extended Drain Intervals – In gasoline engines, up to three times longer service than a conventional petroleum oil. Better Fuel Mileage – Synthetic oils have a lower frictional drag than petroleum oils that allows higher engine efficiency which can increase power and lower fuel consumption.